Here are the early 2018 – 2019 NHL regular season projections and 2019 NHL playoff predictions. 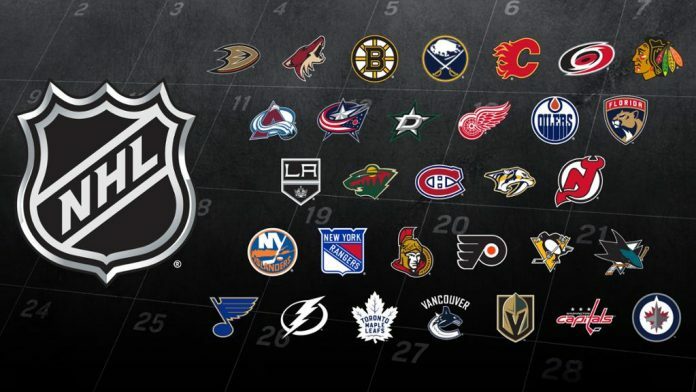 For the 2019 NHL Playoff Predictions… Click Here! The New Jersey Devils, Anaheim Ducks and Colorado Avalanche will take a step back and miss the playoffs this year. The Toronto Maple Leafs will battle the Tampa Bay Lightning for the top seed in the Atlantic Division. Pittsburgh and Washington will be the top contenders for the top seed in the Metropolitan Division. The St. Louis Blues have improved and will battle the Nashville Predators and Winnipeg Jets for the top seed in the Central Division. The San Jose Sharks will be the top seed in the Pacific Division. In the Eastern conference, the Carolina Hurricanes, Buffalo Sabres, New Jersey Devils and Philadelphia Flyers will battle for the final wild card spot. In the Western conference the Anaheim Ducks, Dallas Stars, Edmonton Oilers and Chicago Blackhawks will battle for the final Wild Card spot. The Toronto Maple Leafs finally win the Stanley Cup! Remember these are only predictions and a lot can change with injuries, team chemistry (Ottawa Senators) and other issues. As an Islander fan I love your predictions. LOL. Also Toronto is not that good defensively. It will be tough for them to beat Boston. I like your predictions, however, the very last one is not accurate. Jets win Stanley Cup in 2019.